I recently attended a fabulous celeb, model and beauty-editor filled evening for the launch of Pat McGrath's second line of cosmetic bags for LeSportsac. 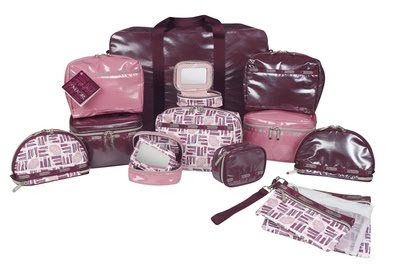 McGrath's oh-so girly-yet-practical take on the cosmetic bag was inspired by the CoverGirl Lip Perfection colors. The bags are available in three different shapes and colors - my favorite, a printed version with lips and lipsticks, pink and berry. These bags are fun and extremely well thought out with all of the fantastic organizing pockets, detachable inner bags and secret compartments! The collection ranges in price from $25 for the small Kiss Case to the large $120 Professional Carry All tote. Inside each bag is a “Pat McGrath for LeSportsac” label sewn into the lining. There’s a detachable CoverGirl hang tag that features custom beauty looks and application tips from Pat. The collection will be sold at LeSportsac boutiques and online starting in June. A coupon for CoverGirl LipPerfection lipcolor* will accompany each purchase. *Review coming up this week!